The Star Trib ran an article a few weeks ago about an event that originally happened back in November. 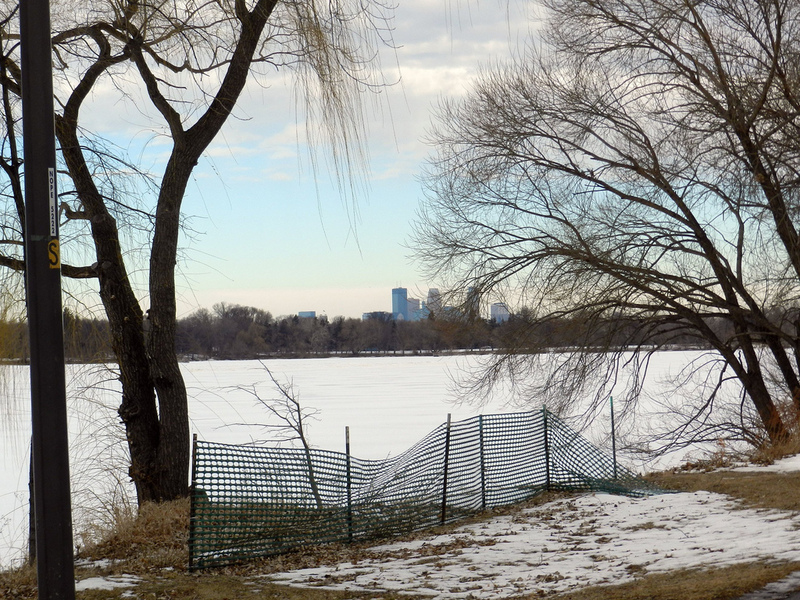 The day before Thanksgiving, an elderly man that was found unresponsive on a park bench at Lake Nokomis. 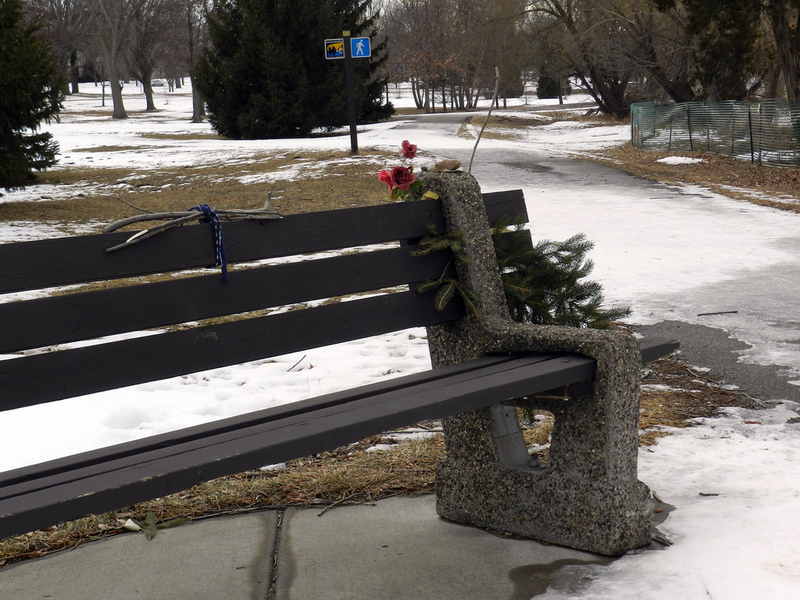 Passers-by called an ambulance, but the man had died alone on the bench, sitting upright, starting at the lake and the Minneapolis Skyline. There was no identification on the body, the story never made the paper, and who the man was remained a mystery. Now, the elderly man has been identified. 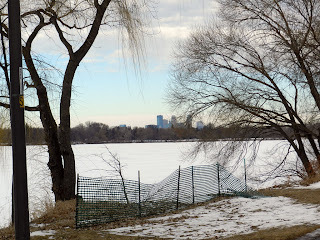 Walkers at Lake Nokomis have also installed a small memorial on the bench where this man took in his last view of the Lake and the skyline. The strib article provides a sort of obituary and a little eulogy that he never got back at Thanksgiving, and the memorial serves a reminder to those that pass by on their daily walks. 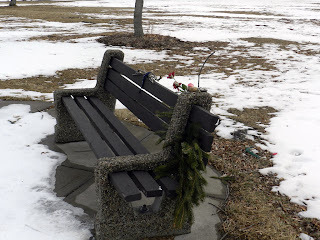 I've always been fascinated with these types of memorials, and pass several on a weekly basis. Each one commemorates a life, but make no mistake - they are for the living more than the dead. Often people with no connection whatsoever to the deceased will leave a memento at the shrine, moved to do so by something that brings the deceased closer. Shared experience, appreciation of the same location, proximity, or maybe some other more personal reason that I could not begin to speculate on. In this case, the deceased, John Scherer, was a stranger to almost everyone. Some recognized him, but none really knew him. That's what makes this memorial all the more touching. The massive public displays of grief at impromptu memorials for celebrities or classmates somehow seem less sincere to me than these small memorials erected for unknown people. 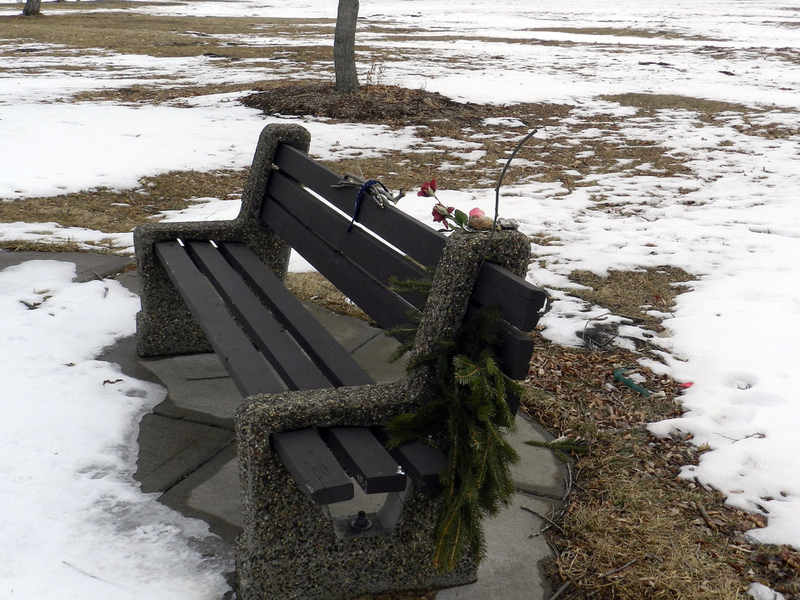 Eventually weather and/or the Park and Rec department will clear this memorial away, but I wanted to capture it before it was gone as a lasting, digital memorial to John Scherer. Hopefully, we'll get a plaque on the bench or something more permanent. In fact, I may just look into doing that. We have been house-hunting, and found what we thought was a winner in the Longfellow neighborhood of So. MPLS. Despite repeated difficulties with the seller, the offer was accepted, the inspection conducted and financing completed. All this while preparing to put our current house on the market, no less. The wheels came off the transaction for the third and final time when the new house appraised well below the contract price. This was the kiss of death to the transaction. We walked away from the deal last week. I wish the seller well and hope he finds some therapy or something to help him resolve his issues. We have also reached the point where my parents need to move into an assisted living situation of some sort. I was down at their place for about seven days, helping out and starting to make arrangements for the future. I anticipate more trips like that in the future, as well. The upshot for me is that a lot of stuff has been placed on hold. I doubt we'll continue the house-hunting for the short-term; we might be better off to wait until things are more settled and then make a long term "where do we want to live" decision rather than just finding a better arrangement in MPLS, anyway. That requires patience, however. I also missed my second welding class at CAFAC and am weighing whether or not I would be better off to drop the class at this point, get a refund and then pick this up when I have more time. So far, sleeping on it has not yielded any insights. I'll go to the next class and talk to the instructor and see what she thinks, I guess. Finally, I volunteered a few hours a week at a local food shelf, in the warehouse and inventory area. I was originally planning to start that last week as well, but that's been slipped a little bit as well. That's easy enough to pick back up again, though, so I'll be there this week and staffing as I can. My New Year's eve rune stone counseled patience. Now I see why. The good news is the creative drought seems to have eased. 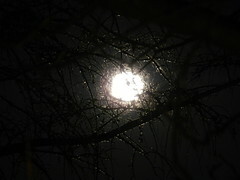 Maybe is the coming of Spring, longer day light, eating oatmeal or perhaps the solar flares. Who knows how the muses work? I am taking an introduction to oxy-acetylene welding class at CAFAC and today we got to spark up the torches and fuse metal. 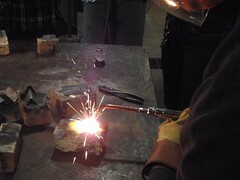 This was the second class - the first was devoted to welding safety and how the torch works (set-up and shut-down). By the end of class I was able to form a puddle and pull or push the puddle to form a weld, but this is definitely something that takes some practice. Heat management via distance and angle is the trick of it all, it seems. CAFAC is very cool; this class is ten weeks long. Once I am through that, I can re-enlist in the continuing education program and get access to the space and equipment at a reduced cost. There are also volunteer opportunities at CAFAC as well, so that's also a possibility. The temperature reached 54 degrees this afternoon and the sun was bright. It was a glorious day, particularly when you consider that it's January 10 in Minnesota. 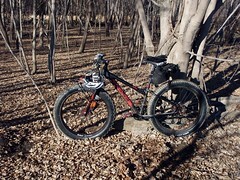 Tomorrow the low temp is supposed to be 5 degrees, so I took advantage of the unseasonable weather by getting in a 2.5 hour ride along the river. It was warm enough that the trails were very muddy - my bike is a mess and my pants and jacket were totally back-spackled with sand and mud by the time I got home. Still, what a blessing to be riding around with no hat or gloves in the middle of January. Get Your Cameras and Get Rolling, Please. People of Earth - I ask for your help in a matter of great importance (at least to me and 619 other people). I am an admin for the Flickr group "Bikebyshootings". This group is dedicated to photography from a moving bicycle. Ideally, we want photos that capture the motion, the feeling of speed and the fun of swooshing around on a bike. We have some really great photos in the group, in fact, the photo with this post was pulled from that group. 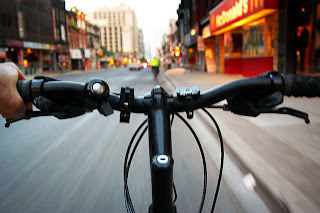 Just think how nice it would be to have a collection of photos that evoke the motion, color, excitement and sheer, unmitigated fun of riding around on a bike. That's what I am striving for at Bikebyshootings. Unfortunately, all is not well in Bikebyshootings. I just finished cleaning up the recent submissions. We continue to get a lot of pretty low-quality photos (and a lot more redundant photos) submitted to this group. The tried and true "photo-of-my-lap-while-wearing-a-skirt" seems to show up once a week or so. The even more tiresome "photo-of-me-riding-an-xtracycle-along-the-California-Coast-in-a-polo-shirt-with-a-camera-on-a-stick" is really starting to get old. Good idea, but give it a rest and try from something different tomorrow, please. Carry a small digital camera with you and take a shot or two each day. Vary the angle, try new things, capture your experience. Recognize that like any worthwhile endeavor, this may not be easy or immediately rewarding, but keep at it. Looking for "the shot" will make your ride more interesting, open your eyes to possibilities you might not be seeing currently, and Bikebyshootings might benefit from your efforts if you submit one or two to the group. Rember - we are looking for photos from a moving bike; we are not looking for photos of your bike, or places your rode to, or for that matter photos of something you saw while sitting on your bike at a stop light don't count for this group (shoot away though - whatever floats your boat). I know my few readers can do better than what we've got out there tonight, in fact our own "Repeet" has posted some of the best photos out there, so it's time we pull together and raise the bar on this group. That's all. You can go back to what you were doing now and thanks for reading. Generally speaking, we are not real big on "family traditions". We generally visit who we need to during the and/or do what seems right on any given holiday. Circumstances change and we need to adapt and respond to that. One tradition we do have, however, is to draw Rune stones on New Year's Eve. For those not familiar with Runes, they are an ancient Scandinavian divination tool; sort of a parallel to the I Ching or Tarot cards, but originating from ancient Nordic cultures. 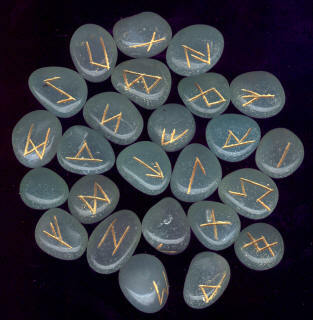 They consist of 24 small stones with runic symbols etched on them. The symbols indicate forces at work in our lives. I have dabbled in the I Ching (absolutely not my culture) and have no interest whatsoever in Tarot cards, but somehow the Runes resonate with me, in spite of my Catholic predisposition to shun divination. Properly approached, the Runes are always spot-on, even if you don't think they are. With the proper intention, it is not possible to draw "the wrong" stone. How can I say that? I have seen multiple instances where someone draws a Rune, dismisses it as being "incorrect" and re-draws the exact same stone (despite mixing the stones well). That's just too strange to ignore. Back in the days when I was pouring everything I had into my career, I frequently drew the Rune of Teiwaz, which looks like an arrow pointing up. This Rune is "a rune of bravery and steadfastness in the face of any adversity. New partnerships will produce great things. This is a rune of energy, contentment and passion and it is a much used talisman. Other meanings include: a brave and noble death, self knowledge, faith, victory and success in law and war". That seems about right in retrospect. This New Year's Eve the Runes pitched me a change-up; I drew the Rune of Raido, reveresed (aka, upside down). Raido is a Rune of personal development and transformation and is indicative of journeys and travel (either physical or spiritual). Either way, this journey will bring about positive developments. Raido also indicates a time of choice and of making the right move to ensure all effort and energy is channeled in the right direction. The fact that the Rune was reversed is a caution, however; it indicates delays and possibly difficult journeys. It can also mean that there are important lessons that need to be learned. And so it goes. I was hoping for something a little more triumphant, perhaps. Still, if I am honest with myself, that seems like it might be the right Rune for this New Year's Eve.